You don''t always need a cow call to bring bull elk into bow range. Reach for a bugle and bring them in running. Of the many big game adventures I've been fortunate to experience over the years, nothing compares to bowhunting bugling bull elk. It's a riveting, dramatic, in-your-face affair that never fails to raise the hair on the back of my neck every single time, and it doesn't have anything to do with static electricity. That's why it’s disappointing when most bowhunters I compare elk notes with almost always tell a different story. Seems the vast majority only hear distant bugles; when they try to close the gap, the bulls shut up or vanish. Is this because herd bulls avoid confrontation by rounding-up their harem for parts unknown? Is it because "call shy" bulls on public lands are wise to the tactic of bugling? Not at all, says elk hunter extraordinaire, George Dixon. 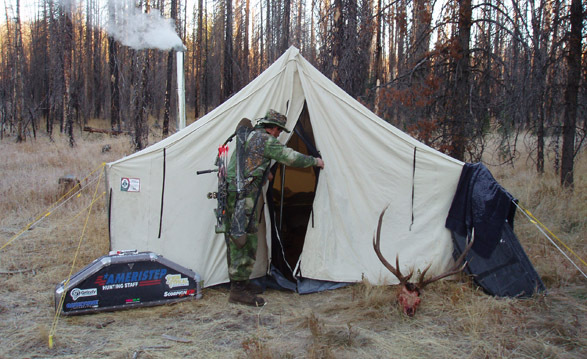 The veteran Mathews Pro Staffer from Salida, Colorado doesn't care if he's on a national forest or a private ranch (he says he hunts 99 percent on public tracts). When he wants results, he reaches for his bugle, not a cow call. "(Not being able to) bugle bulls within bow range is a bunch of baloney," Dixon says. "My outfitter friend, Gary Bohochik, guides exclusively on public lands, and he doesn't even own a cow call. All Gary does is bugle, 500 times a day if necessary. And does he ever get results!" If bugling is so effective for these guys, why isn't it for the rest of us? "They're spooking bulls instead of attracting them. It takes some skill to sound like a real bull, and relatively few guys can pull it off. Every year I call-in hunters, and they all say the same thing: 'I had no idea a hunter could sound so much like an elk!'" This is exactly what happened last fall when Dixon and I were working a bull not far from his home. We kept hearing faint cow calls and, sure enough, I caught the movement of a two-legged predator in the shadows. We gingerly backed out of that basin, and to this day I'm sure that camo coat thinks a big bull gave him the slip. The solution may be simple but it’s not going to be easy. "I wish I could say there are lot of super-sounding bugle calls that are super-easy to master," Dixon says. "But there aren't. An elk bugle is complex and not easy to duplicate. On top of this, the best sounding call is the diaphragm, and it requires the most practice to perfect. You just can't purchase a call two weeks before season and expect dramatic results. You'll scare elk away. It's like shooting a bow. Practice makes perfect. There are no shortcuts." No question mastering the diaphragm call involves repetition. Last fall when I heard Dixon work his magic, I determined in my heart that I would not settle for anything less than his level of proficiency. Nowadays I practice nearly every day. I must be getting pretty good because my neighbors are convinced there's a bull on the loose in our township (one even called the local zoo). There's a right and wrong way to practice bugling. The beginning point is knowing precisely what to sound like. As elementary as this may seem, many bowhunters make the mistake of trying to make an elk sound rather than making a specific call. Briefly, you want to make the sound of a mature bull, and not a "little bull." Also, master a unique bugle that you can replicate every time. To do this you'll need a taped recording of a live bull. My favorite is an old Larry D. Jones cassette recording, Natural Elk Sounds (Wilderness Sound Productions; 800-437-0006). Wayne Carlton's original recording is another good one (available through Hunter's Specialties). In recent years a few game call manufacturers have videotaped rutting bulls in the wild. Primos Hunting Calls offers some of the best. Once you get in your head the exact sound you're trying to duplicate, you're ready for some serious experimenting. Two key variables affecting a call's authenticity are placement and pressure. A third variable is how hard you blow the call. I wish I could offer a simple recipe for combining them into a can't-miss finished product, but the truth is it would surely be half-baked. Only you can put it all together—it takes time and self-discipline. Fortunately, these calls are inexpensive with many makes and models to choose from—Hunter's Specialties, Outland Sports (417-451-4438), Primos Hunting Calls, M.A.D. 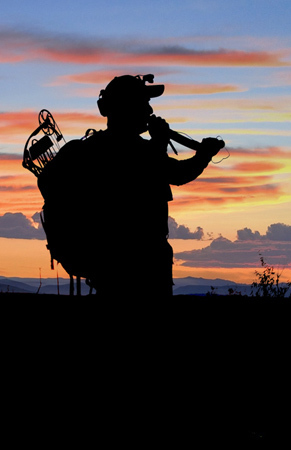 Calls, Wilderness Sound Productions, Knight & Hale Game Calls, Quaker Boy, Woods Wise Products, etc. Plan on purchasing at least a dozen to begin with, and try every one out. You're going to find that a few might not produce the pitch and tone you're looking for. And as a general rule, triple-reed models tend to produce the loudest volume and the best gradient of tones, although single- and double-reed models are easiest to call with. Before long, you'll discover just how much tongue pressure and air force it takes to produce the tremolos bugles are famous for. "Keep playing the tape, comparing it to your calling," Dixon says. "Don't give up till you sound like a real bull. Practice all the time, especially in your vehicle as you drive to and fro. Nobody can hear you so you can just let it rip." Gary Bohochik with Rocky Mountain Outfitters is the first to admit a bugle won't work every time. Some bulls are responsive, some simply are not. You never know what kind of customer you're dealing with till you knock on his door. For this reason you've got to be mobile. 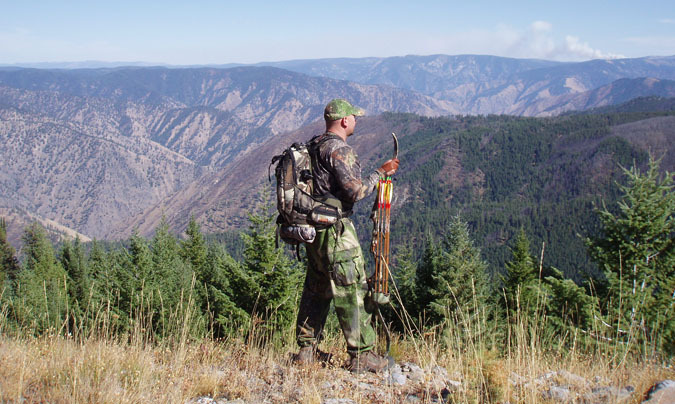 "Most elk hunters have a hard time believing how nomadic bulls can be. Sometimes they might hole-up in a particular basin for a week, but most of the time they're constantly on the go. I remember the time I called in a nice 5-by-5 for a client who was unable to get the draw. That bull was wearing a numbered collar when we met up with him around 9:00 in the morning. Well, we ran into to him again that evening a good 20 miles away as the crow flies. There really wasn't a good reason for that bull to travel that far, but he did. The moral of this story is come prepared to do a lot of walking." Bohochik's next piece of advice as important as the first. "I also recommend calling a lot. And by 'a lot' I mean almost constantly. I don't believe a hunt begins until you get a bull to respond. If you're not hearing any bulls, you're probably not into them yet. Bulls are vocal animals that are curious and social. If they're within hearing distance, they'll usually respond. So keep moving till you hear elk bugling. Rule Number Three complements the other two—call as loud as you can. "If your call sounds halfway decent," adds Bohochik, "you'll never spook a bull. Bulls might retreat or they might ignore you, but they'll never get scared. That's why I always call as loud as I can, even when I'm approaching bow range. I want that bull to think I'm the real deal. The fact of the matter is that bulls don't call softer when they approach each other. In fact, they often call louder, sometimes trying to out-shout the other." Finally, learn how to put on the pressure. "My favorite strategy is forcing the issue with a bugle," says Brad Harris with Lohman Manufacturing. "It's usually a waste of time to try to 'seduce' a bull that owns every cow on the mountaintop. This bull's not one bit insecure and therefore not vulnerable. Your only hope is pressuring him. "I believe every bull has a comfort, or tolerance zone in which he will not be aggressive. It changes every day, sometimes by the hour. If you stay outside of this zone, the bull will probably bugle, but not move any closer. However, sometimes if you can penetrate this bubble you can get him to the breaking point and make him snap." In simple terms, Harris wants to challenge the bull so it will either charge or retreat. Harris is convinced that too many bowhunters lay back indecisively when they should be moving in for the kill. The ideal situation is when cows are scattered, satellite bulls are roving, and the boss bull is trying to round up his herd quickly. If the bull gets the least bit frustrated over not being able to gather his harem right away, he's apt to charge when you bugle. This is exactly what happened a few years ago when Harris arrowed his best-ever bull, a massive Arizona brute that scored 376 Pope and Young points. So master the bugle. Blow it loud, blow it often, cover a lot of ground. Chances are good you'll call more bulls than you thought possible.